Fitting right in with the theme of New Orleans, there’s the Mint Julep Bar where you can get Mickey-shaped beignets and mint juleps. And some other stuff that I’m not blogging about right now. 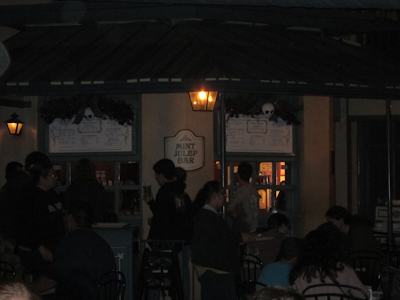 The Mint Julep Bar is tucked away in a corner in the back of the French Market restaurant. Real mint juleps consist of water, sugar, mint, and bourbon. Obviously that’s not very Disneyland-friendly. 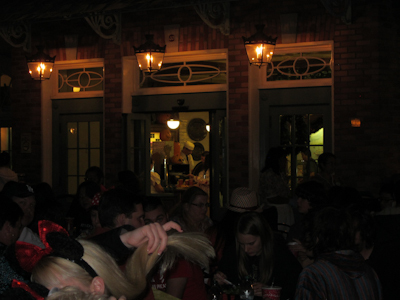 The only place you can drink in Disneyland is in Club 33. There’s alcohol available in the Mouse-Next-Door though. Anyway, let’s look at another pretty picture. Instead of bourbon, Disneyland uses non-alcoholic Creme de Menthe syrup, lemonade, and limeade (with some real mint leaves). The result is a bright green, extremely sweet drink. I will admit I’ve only had Mint Juleps a couple of times. The sweetness can be really overwhelming. But sometimes on those really hot days, it totally hits the spot. Seating is cramped, and there’s a weird hand in the foreground of my picture. Go figure. 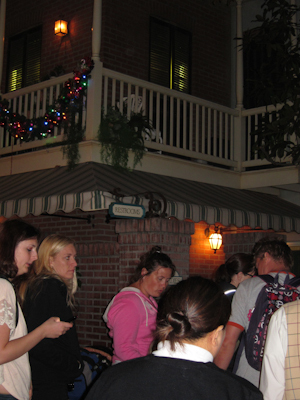 Also back in this area is the New Orleans Square bathroom. 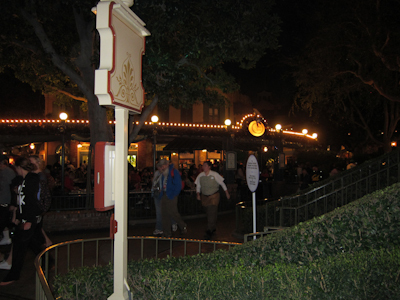 If you’d like more information about the restrooms at Disneyland, and I know you are dying for it, visit the most excellent page: The Happiest Potties on Earth. I will say, though, that I’m not a fan of this particular restroom. It gets a ton of traffic because it’s the only restroom in the area. There are a lot of stalls (in the ladies–never been on the gentlemen’s side) but there always seems to be a backup at the sinks. I try to avoid this one myself, mostly because of the crowd. But when you gotta go, you gotta go! This is an opportunity to mention the most enjoyable restroom experience in Disneyland, (for men) in Critter country, the restroom at the Hungry bear restaurant is by far, the most spacious restroom facility in the park. It is actually located below ground level and under the service windows. To get there you must walk down a flight of stairs or follow a few switchbacks on the wheelchair path. Over the last few years Disneyland has chosen to remove almost all of the warm air hand drying equipment in favor of dispensed paper towels. I distinctly remember warm air drying my hands dry at a Fantasyland restroom location as recently as Sumner 1998, but it seems that Disney has either decided that it is cheaper or more sanitary to let people dry their hands with paper towels (perhaps as part of some sort of sponsorship agreement, does Brawney paper towels sponsor an attraction?) But the men’s room underneath the Hungry Bear restaurant is the only restroom I am aware of in Disneyland that has the Dyson Air blade hand drier. The Dyson hand drier is far more efficient than the warm air blowing machines and it dries a person’s hands completely in less than ten seconds. and saves the use of paper towels almost utterly. I wonder why the Dyson Air Blade system has not been installed at many more locations. In the mean time, men who visit the restroom in Critter Country below the Hungry Bear Restaurant can experience the wonder that Dyson has presented to us in the form of a paper towel free hand drying system.